I'm both proud and thankful for this humble little blog known as Relaxed Hair Health. This forum has provided me the opportunity to public challenge myself with regards to my healthy hair rituals. Most importantly, this blog has also allowed me to connect with others who've also learned with me along the way. Which is why I was both honored and excited about being contacted by a major hair care company that offering a paid opportunity to do what I love to do best, talk about my hair experience. Before I move forward, I want to make it extremely clear that as a part of my review, I was given complete freedom to be totally honest about my experience-no matter the result. With that said, let me tell you more about who they are and why I was willing to try out their products. The brand I'm referring to is Creme of Nature. I'll start off by giving you a little background about my experiences with Cream of Nature (or CON as it's affectionately called on the hair boards). Their shampoo and conditioner was a staple in my regimen for years. Even my mom used their products religiously. Somehow, I found myself moving to other products as a result of the unquenchable "product junkie" habit I began to develop around that time. Now that my habit has somewhat subsided, I figured now would be a good time to go back to an old friend. Cream of Nature generously offered to reimburse my cost of buying the products for review. For the first time in my life I could splurge on products I wanted without even the hint of guilt. So off I went to the largest beauty supply store in town. The beauty supply store is now situated in what was once a Publix supermarket, a large and very well known chain in our area. This place is aisle upon aisle of hair product heaven. I try, for the most part to stay out of there for fear of blowing my budget. This time, however, I knew this was the place to be simply because they would house the largest selection of Cream of Nature products to choose from. After several minutes of walking up and down the aisles, I had to summon a young lady for a little help. I couldn't find the CON bottles anywhere. When she finally took me down the same aisle I just walked moments before, I knew why I had so much trouble. 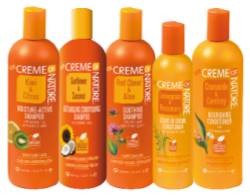 Creme of Nature completely redesigned their look. Not only that, they now boasted of including ingredients we discuss alot about here on this blog- natural plant oils. So there I am standing in front of multiple CON bottles. Last time I remember, they didn't have so much variety to choose from. Even though I probably had free reign on any product I wanted. I only went after the products I needed. I like to consider myself a conditioner connoisseur so I immediately gravitated to their Moisture Extreme conditioner and their Nourishing and Strengthening treatment. Oh, and I also grabbed the Red Clover and Aloe Daily Breakage Relief, for good measure. The next day, I prepared my hair for the wash as I customarily do with a steam pre-poo treatment. As with any (and every) product I review on this blog, I used the product alone without the use of additional oils, butters, or even other conditioners. That way, I can get a true feel of the product's effectiveness without any extra additives. Lucky for me though, these conditioners already contained natural ingredients such as orange oil, grapefruit seed extract, coconut oil, shea butter, jojoba oil and more. You should also be aware that the product also contains some silicones similar to the ones you find in shine serums. So, after I've washed an rinsed I begin the process of applying the conditioner. At this point, I'm feeling kinda bad for these conditioners because they've got their work cut out for them. I'm now 15 weeks into my longest stretch ever and, believe me, it ain't pretty. I start by mixing the moisture conditioner with the strengthening treatment. Immediately I'm taken back several years by the signature Creme of Nature scent I recall from days past (ah the memories). As I start applying the product to individual sections, the first thought that came to my mind was "instant slip." I've experienced slip before as I've washed out conditioners but it doesn't often happen during application. What I appreciate most about this slippage is it allows me to divide my hair into sections for smoother conditioner application without much resistance. Once I applied the product, I fired up my steamer and let the Creme of Nature do it's thing while deep conditioning. After the final rinse I began to roller set. Lately roller setting is taking me much longer because of the incredible amount of work needed to work thru tangles and smooth out with a fine tooth comb. By the time, I carefully finished off one side of my hair, the other side was almost dry. This gave me an opportunity to scrutinize the air dried ends for a glimpse of what I could expect from the product when I removed the rollers. Based on my observation, the hair appeared a bit straighter than normal which put my mind at ease a bit about what I could possibly expect to see later on. So after the rollers were out and I've flat ironed the roots, I take a look at my hair and, to tell you the truth, I had no idea that I'd be able to wear my hair the way it is now this many weeks post relaxer. I finished the style with my oil blend and called it a day. Kudos to Creme of Nature for working to keep my hair manageable. So far, I like what I've tried and I can't wait to see how the daily breakage relief works when used consistently. Going forward I will be including these two conditioners into my rotation. Cream of Nature, I welcome you back, old friend. If you think those are good you should try the CON professional line. A friend gave me a sample a few weeks back, and I must say it is amazing. The shampoo isn't drying at ALL, and the conditioner does everything you want to be done to your hair. Just got my new Essence mag and I saw you in the CON ad! Congrats to you and the blog!! Keep up the great work. @ DeJa-"Thanks for the tip. The Professional line sounds awesome. @ Lady-I'm really excited about that, I've always wanted to model in a hair magazine but I guess this is as close as I'll get. Anon, I understand your concern 100%. In this case, I was very familiar with Creme of Nature products as I've used it as my main staple products years ago. There have been others who've contacted me about product/website reviews before but I've past those up. I love the Extreme Moisture Conditioner as well. My hair is manageable and so soft. This conditioner is underrated. It's affordable and it works!! !